Ghalegaun is a colorful village with picturesque hills and mountain scenery. This is one of the unspoiled habitats of Gheles, the famous Gurungs, the legendary ‘Gurkhas’ of western Nepal. The village is splendid microcosm of Nepalese village with the blend of exotic culture and natural beauty. Ghalegaun is 205 km northwest of Kathmandu and 125 km northeast of Pokhara. 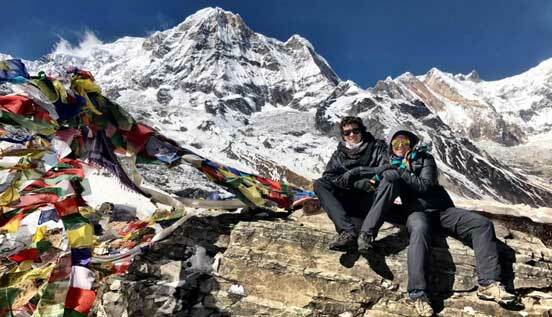 Perched at the ridge top at 2,095 m, the village hosts the close up view of western Himalayas including Machhapuchhare (6693m), Annapurna(8091m), Annapurna II (7939m) Annapurna IV (7525m), Lamjung Himal, Bouddha Himal (6974m), Himalchuli(6747m) and other small peaks. GhaleGaun has been recently open for foreign as well as domestic guests as one of village tourism destination. Families in the village have allocated rooms in their houses for guests. Rooms are simple, clean and comfortable with basic facilities. The village is extremely self sufficient and harvests are organic. Labor based primitive agriculture, household chores with locally made simple machines and the happy life of joint family is the living ethnic tradition passed down from generations. 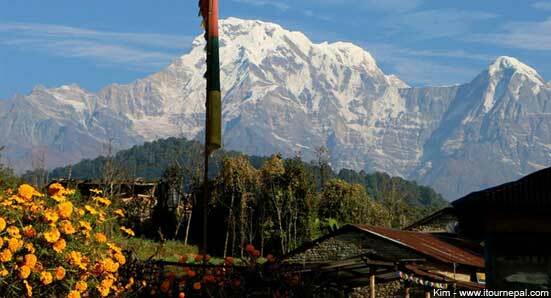 Majestic view of snow peaks and warm hospitality of Gurungs leave each guests spellbound. DAY 02: Trek from Beshisahar to ghalegaun 2,095m /4 hrs. We will climb for about 4 hrs to the ridge top village of Ghalegaun. Ghalegaun is a typical Gurung village situated in the foothills of the Annapurna range. This is less visited unlike popular trekking route. 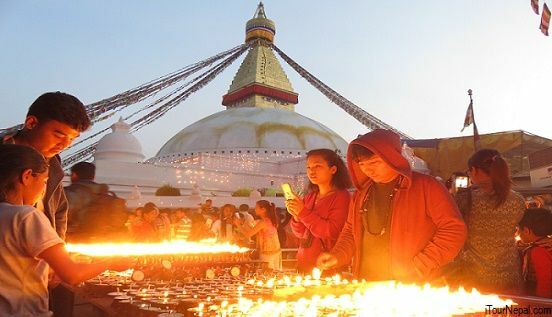 One can get a true insight of Gurung culture with home stays and cultural programs. There are Gurung pilgrimage sites in and around this region, including the Samba Chhyoling Gompa at Nassar Danda. 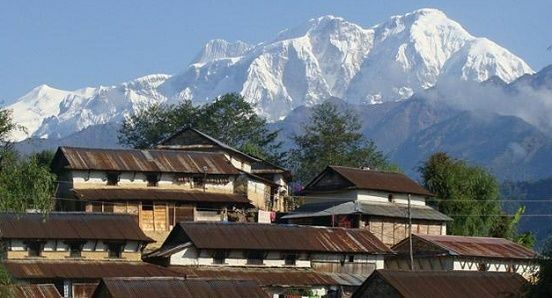 The peaks such as Annapurna range, Lamjung, Ganesh Himal, Manaslu and several other unnamed can be seen from these villages. The area is abundant with green pastures of grasslands. DAY 03: Trek from Ghalegaun to Ghanpokhara (2,157m.) which takes about half hour. 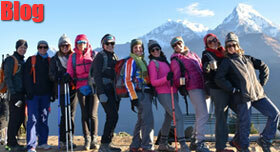 You hike from Ghalegaun to Ghanpokhara. You can enjoy the view of sunrise and surrounding mountains as Mt. Annapurna and Manaslu ranges. You can experience the village tour. Ghanpokhara is about 100m above Ghalegaun. DAY 04: Trek from Ghanpokhara to Khudi and it takes about five hours. This day you can see waterfall and cave. You can also visit construction site of Khudi Hydro Electricity Project. DAY 05: Drive from Khudi to Kathmandu or continue to Pokhara. 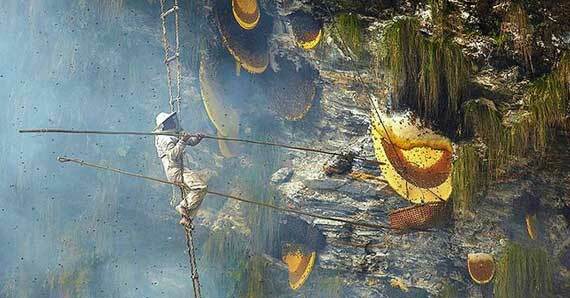 Honey hunting is traditional skill used by tribes to collect honey from wild bees in the Himalayan foothills. Tribal elders hang by the cliff with the help of locally made rope and ladder to collect honey of the world’s largest honeybees. Climbing through the thick smoke used to disperse the bees, honey hunter poke the hive with one stick and collects the chunk in the basket he is balancing with another stick. The hunting needs great courage and balance to work while dangled hundreds of feet above the ground. With the world knowing the benefits of wild honey and its medicinal value, excessive honey hunting is done with modern technics (trafficking) putting the tribal way of life at risk. Native wild bees have also been victim of global warming and other environmental issues. This honey hunting program is lunched to preserve the tribal ways of life and keep the tradition with the help of sustainable tourism. DAY 02: Trek from Khudi to ghalegaun 2,095m /7 hrs. DAY 05: Trek from Ghanpokhara to Khudi and it takes about five hours. DAY 07: Drive from Khudi to Kathmandu or continue to Pokhara.